For Tanners | Eye Pro, Inc.
Sun Evolutions, Heartland Tan and Eye Pro donate $2,350 to Best Friends Animal Rescue! May 2017 – Sun Evolutions, Heartland Tan and Eye Pro teamed up in April to raise funds for Best Friends Animal Society to prevent 9,000 dogs and cats from being killed daily in shelters. 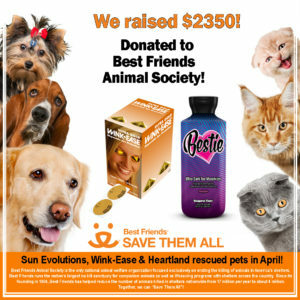 During April, $3 was donated to Best Friends Animal Society for every “Best Friends” deal purchased from Heartland Tan. The April deal included a bottle of Bestie tanning lotion from Supre Tan and a box of EYE PRO’s Wink-Ease disposable eye protection. Best Friends Animal Society is the only national animal welfare organization focused exclusively on ending the killing of animals in America’s shelters. Best Friends runs the nation’s largest no kill sanctuary for companion animals as well as lifesaving programs with shelters across the country. Since its founding in 1984, Best Friends has helped reduce the number of animals killed in shelters nationwide from 17 million per year to about 4 million. Together, we can “Save Them All”! “Sun Evolutions is a sponsor of Best Friends, and we were delighted to team up with industry leaders, Eye Pro and Heartland. We want to thank all the salons that enthusiastically supported us by buying this deal!”, exclaimed Maggie Curran, Vice President of Sun Evolutions. “Wow! I can’t believe we raised $2,350 to help find forever homes for pets nationwide! Thanks to the salons, Heartland, and Sun Evolutions who all made this promotion a raving success!”, said Brenda Fishbaugh, President of Eye Pro. Contact Heartland Tan at 1-800-554-8268 to stock up for your Wink-Ease and your favorite Sun Evolutions products. For more information on Best Friends Animal Rescue, visit BestFriends.org. For more information on Ultra Gold WINK-EASE, Lash Room WINK-EASE or WINK-EASE Dark visit WinkEase.com or contact EYE PRO at 1-800-726-8322. Follow and “like” WINK-EASE on Facebook, Twitter, You Tube, Instagram and Pinterest to learn about educational information, special salon offers and promotions, and find fun tanning ads to “share”! Posted in Articles of Interest, Exotic Animal Advocacy, For Salon Owners, For Tanners, Press Release | Comments Off on Sun Evolutions, Heartland Tan and Eye Pro donate $2,350 to Best Friends Animal Rescue! 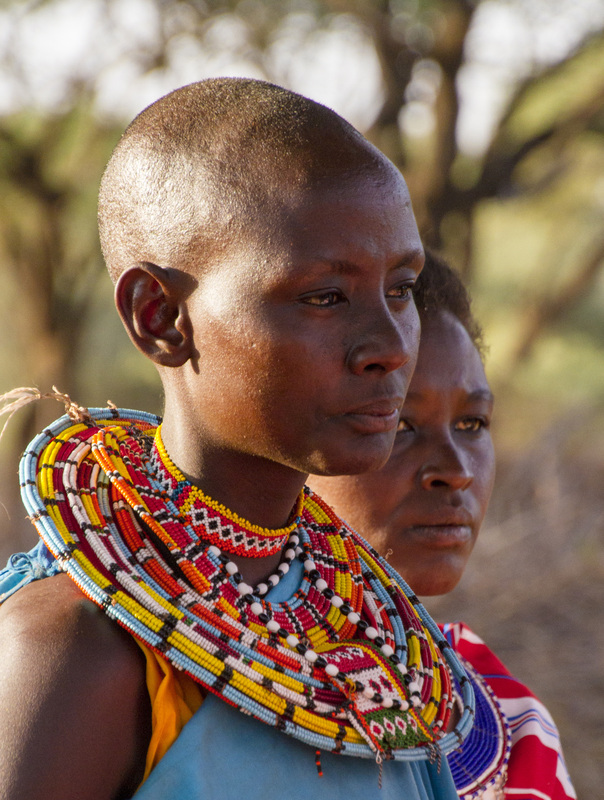 June 2015 – EYE PRO, Inc., world leader in eyewear and makers of Ultra Gold WINK-EASE, WINK-EASE Dark and the NEW Lash Room WINK-EASE, has purchased fifty beaded bracelets made by Kenyan women and will be giving them away to tanning salon owners during several Facebook promotions. Eye Pro’s president, Brenda Fishbaugh returns to Africa — read her article featured in the May 2015 issue of IST magazine. This was my sixth time in Africa and third trip in five years to Lewa Wildlife Conservancy, one of the leading organizations working to save rhinos from poaching. Rhinos are being killed for their horn, which is used in traditional Asian medicines because it is mistakenly believed to have healing properties. Located in central Kenya, Lewa Wildlife Conservancy is working to protect rhinos by providing a safe sanctuary for them and providing the food sources they prefer. Elephants and rare Grevy’s zebra also are protected by armed guards and patrolling airplanes and radio collars. 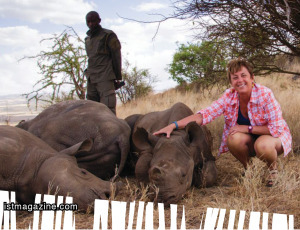 This huge effort is funded in several ways, with the American Association of Zookeepers (AAZK) “Bowling for Rhinos” fundraiser providing substantial support, as well as money raised through tourism and donations. Posted in Eye Protection Articles, Eye Protection Articles, For Salon Owners, For Tanners | Comments Off on Just Wear It! As seen in February issue of IST Magazine…. 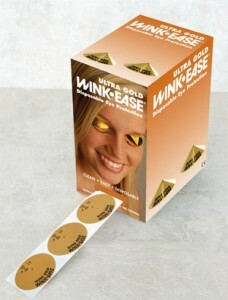 The BEST just got better – Ultra Gold Wink-Ease! “We have been in the eye protection business since 1985 with our ‘original’ WINK-EASE product,” said EYE PRO President Brenda Fishbaugh. “It was time to make a few product improvements, including improving the adhesive, visibility and ease of assembly. All of these amazing enhancements — and the product still has a complete UV block! “continued Fishbaugh. 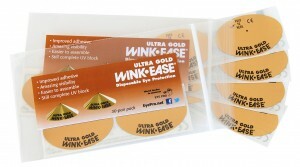 “The new Ultra Gold Wink-Ease, like the original product, is fantastic for stand-up units as well as traditional beds. The improved visibility is amazing – you can read a few text messages or emails while tanning.” Fishbaugh explained. “We are excited we were able to provide such a wonderful ‘new’ product — and keep the same great price.” she concluded. 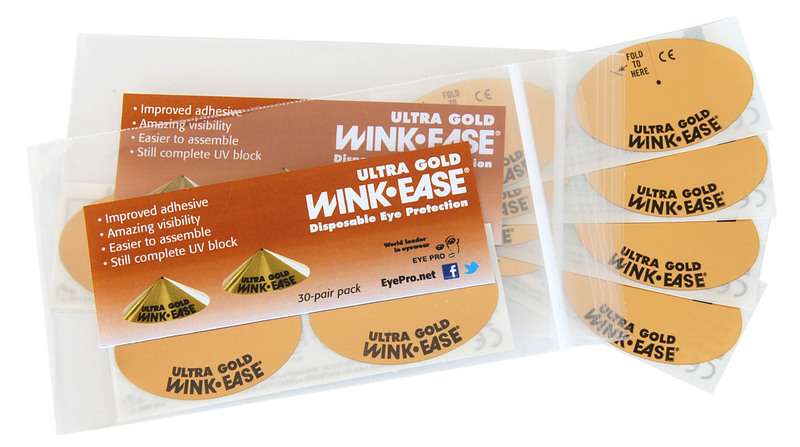 For more information on Ultra Gold WINK-EASE and VIEWkeepers disposable eyewear, Wink-Ease Dark disposable eye protection for red light and Fresh-Ease Refreshing Body Cloths for after tanning, visit EyePro.net or contact EYE PRO at 1-800-726-8322. Follow and “like” EYE PRO on Facebook and Twitter (Wink-Ease/Eye Pro) to learn about special salon offers, promotions and updates. Posted in Articles of Interest, Articles of Interest, For Salon Owners, For Tanners | Comments Off on The BEST just got better – Ultra Gold Wink-Ease! – also known as sunburn – and we know those symptoms well. They include reddening of the skin, an itching sensation, and in more extreme cases, blistering and peeling. But did you know that you can also burn your eyes if you overexpose them to UV light? Posted in Eye Protection Articles, Eye Protection Articles, For Salon Owners, For Tanners | Comments Off on Don’t Risk it! August 1, 2013 – EYE PRO, Inc., world leader in eyewear and makers of WINK-EASE, Viewkeepers, Fresh-Ease, and Wink-Ease Dark, participated in the 7th Annual Vision Walk in Fort Wayne, Indiana on Saturday, June 8. 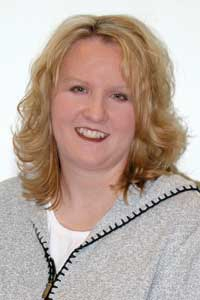 “Since we have been supporting and educating tanners for 25+ years on the importance of protecting your vision, it only makes sense that we support VisionWalk 2013,” said EYE PRO president Brenda Fishbaugh. I was recently asked if a person could suffer loss of night vision from tanning indoors without eye protection. The answer is ABSOLUTELY! The ONLY way to lose your night vision is from UV-overexposure. This can happen from outdoor sun exposure or from tanning indoors without eye protection. Posted in Eye Protection Articles, Eye Protection Articles, For Salon Owners, For Tanners | Comments Off on Guard Your Night Vision! Eye Pro Teams with Sunwest to Add Option for Sunless Spray Tanning Eye Protection! 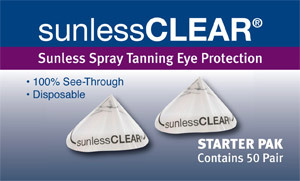 July 1, 2013 – EYE PRO, Inc., world leader in eyewear and makers of WINK-EASE, Viewkeepers, Fresh-Ease and Wink-Ease Dark, announces a teamed effort with Sunwest, Inc. to offer a clear, disposable eye protection for sunless spray tanning. The FDA (Food and Drug Administration) updated its position on sunless spray tanning in June 2012. The FDA highly recommends that all sunless spray clients should protect their lips, eyes and noses when sunless spray tanning. Posted in Articles of Interest, Articles of Interest, For Salon Owners, For Tanners | Comments Off on Eye Pro Teams with Sunwest to Add Option for Sunless Spray Tanning Eye Protection!